Hexers are trained in the Church of Technology to protect the virtual world and Isidore RAM is the best of the best. She has nearly completed her training when a rogue AI tampers with the Code of the Circuit and Isidore is held responsible. Exiled from the Church and all she has ever known in life, she is forced to reside in the unforgiving dystopian landscape that is reality. However, Isidore is determined to find the rogue AI and make it fix what it has done to her. With the help of some unlikely comrades she meets along the way, she must follow a trail of clues both in reality and in the virtual world to aid her in solving the mystery that is keeping her from returning to her old life in the Church: the mystery that is called CRI-LUX. Author Amanda Orneck has crafted an exciting new science fiction novel that was recently published by Inkshares. 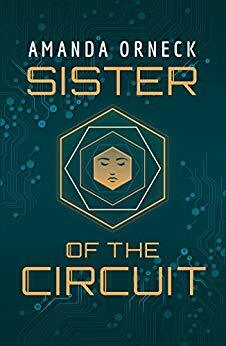 Orneck thoroughly impresses with her storytelling craft and readers are in for a treat when they pick up Sister of the Circuit for this is not just another futuristic dystopian science fiction that takes place in a virtual world. It is a fascinating tale of a girl who believes she was born and raised in a virtual reality and believes nothing else exists outside of it. It is a non-cliché dystopian novel where the world has fallen from what it used to be, yet not all is doom and gloom. It is a thought provoking story that delves deep into subject matters that have arisen since the internet was created as well as topics that are not touched upon as much anymore. It is an enticing new addition to the cyberpunk genre that takes readers on an adventure they will not wish to stop reading. Orneck’s take on a dystopian world is a breath of fresh air as it veers away from the norm that is found in most dystopian novels today. Rather than beginning her book with or having one character explain EVERYTHING that has happened to the world to make it fall into turmoil and reach its final days, Orneck has left her explanation enshrouded in mystery. The world in Sister of the Circuit has seen better days, but it has not yet reached the end times. People residing in the world are not living like royalty, but they are not just scraping by either. Events of what happened are mentioned briefly, but most information is kept to a minimum. Keeping this information in the dark makes readers incredibly curious and keeps them turning pages, wanting to learn more. One of these mysteries is actually one of the main topics in the story: the virtual world of the Circuit. The way people get into and move around within the virtual world have similarities to Ernest Cline’s OASIS in Ready Player One, but this is where the similarities end. Readers will witness the Code of the Circuit through the eyes of Isidore and they will become entranced by what one can do within this world and what it has to offer; however, readers will find themselves questioning: what is this virtual world’s true purpose? It is really fascinating for this important aspect of the book to be so enshrouded in mystery and yet another aspect to peak readers’ curiosity. Orneck continues her clever storytelling as she touches upon a subject matter that has been around for years: virtual reality versus reality. We as human beings spend so much time on technology day after day that we almost become a part of it. There are times that it can even be difficult to separate our digital lives from our real lives. Sister of the Circuit really shows this struggle of how we use technology to escape, of how we sometimes hide our true selves behind the screen, and of how our “digital” selves can become more confident than our “real” selves. It is wonderful for people to gain this confidence and technology is wonderful to interact with people around the world, for enhancing businesses, and a plethora of other things, but digital interaction does not and cannot take the place of physical interaction. We need actual human interaction whether we believe so or not and Orneck portrays this subject matter very well in her story. More and more science fiction and fantasy novels are sprouting up that house a very nice addition to the story: having faith and believing in a Lord that has created all life. Religion is a touchy subject and will put off many readers from finishing a story if it comes up. While it is not a major focal point in Sister of the Circuit, Orneck cleverly tosses in subtle hints at religion that can be found throughout the story. The hexers are brought up to believe that the Circuit created the world, yet when Isidore is introduced to the real world, she also discovers that there is an “Architect” that is responsible for creating everything. Even one of the characters states, “This world is far too beautiful to be some anomaly of a digital system” (Orneck 200). This plays very well into Isidore’s character and her development. Isidore essentially represents humanity today, especially the younger generations that are now being born in a world of technology and raised with it and, most likely, even by it. Isidore was raised to believe the Code of the Circuit was the real and only world. When she discovers a much larger world outside of the Church, she becomes confused and does not know what to believe. The beliefs of humanity are constantly tested and some are able to find something they believe in while others struggle. Orneck beautifully portrays through Isidore the inner struggle of not knowing what to believe, yet having the faith to understand all beliefs and coming to one’s own conclusion as to what is the truth. The cyberpunk genre has gained a wonderful new story and readers are most certainly going to enjoy Sister of the Circuit. Orneck has taken common themes found in many futuristic dystopian novels today and has impressed by making them unique and thought provoking. Some parts of the story do move rather quickly and many elements remain enshrouded in mystery, leaving readers with questions; however, this makes the story even more intriguing, keeping readers turning pages to learn more about Orneck’s fascinating world. Thankfully, Orneck is already working on her sequel Code Siren for once readers complete Sister of the Circuit, they will greatly wish to know what happens next.